When you think of getting an enhanced sound system in the car, you have to get the ultimate subwoofer that will boost the sound system. Once you got the ideal subwoofer for your car, you don’t need to hire an expert to install it. This is because the process of installing the subwoofer in the automotive is relatively simple and fast. By following certain simple steps, you will easily install the subwoofer without spending more cash. Here are some of the steps you have to follow to successfully install the subwoofer in your car. There are several items that you will need to complete the process of installing the subwoofer. The equipment and parts will always depend on the type of car you are installing the subwoofer. Here are some of the key things you will have to put together. A wire metal coat hanger – this is for pulling the wire and bending into the straight piece. Other than the above things, you also have to get different electrical connections. For example, you will require +12V battery connection that has a fuse and audio signal source. This is mean for providing the signal to boost the amplifier. Lastly, you also have to get the ultimate solid connection for the metal car body. This is the beginning point when you need to get the subwoofer installed. After the device has been delivered, you have to know the tools you will require to complete the installation. The kit needs to provide nothing less in order to make the process a bit faster. After putting everything in place, you also have to go through the manual. Every subwoofer will come with a manual for the installation. It is vital to read the instruction even if you have the idea of what needs to be done. This will make sure that you don’t miss anything in the process of installation. After getting everything in place, you should begin by creating the space to install the subwoofer. This should start by measuring the face of the box. When doing this, you should leave some inches below and above the outer dimensions of the speaker. You should then cut all the other three sides of the box. Using the speaker as the template, create an opening to place the subwoofer. Remember to mark all the drilling holes for the screws you will use in tightening the subwoofer. This is the third step you will undertake to complete the installation of the subwoofer in the car. After the construction, begin by mounting the amp. In order to easily orient every component, you should find out where the bottom of the amp sits. This should come after installing the spiked feet. It is always simpler to find the bottom with some subwoofer. This is because it features the holes for spikes. In the case where the holes aren’t available, you have to find the bottom part by checking the manual. should use the star-screw for tightening them. Tighten properly to achieve an airtight seal. You also should connect the remote wire at the stereo to the remote lead. Alternatively, it can be connected to the +12V accessory wire. Once the amp is in place, you should now assemble the subwoofer. It should be securely mounted using the screws provided in the box. This will make it tight to avoid unnecessary noise as you drive. Additionally, you also have to attach the grill that will aid in protecting the cone. Once this is done, you have to connect it to the amplifier. In order to get more power, you should wire the amplifier in the bridge mode. This will definitely boost the power and sound system. Are you using the factory stereo or an aftermarket stereo? speaker adapter level or speaker inputs to the amp is found. On the other hand, when using the aftermarket stereo, you should connect it to the subwoofer RCA jacks or the rear. This will provide you with a better sound once you complete the process of installation. At this point, you are almost done. All you have is to set the crossover and the gain. This is done by playing the stereo at a medium volume. Always remember to play some music you are familiar with. At the moderate volume, you should adjust the low pass crossover. This needs to be done until you can only feel the base. Once again, turn the amp to start from zero. Continue adjusting this until you get a sufficient bass that will suit you. By doing this, you will be able to get the best bass that will rock your music. 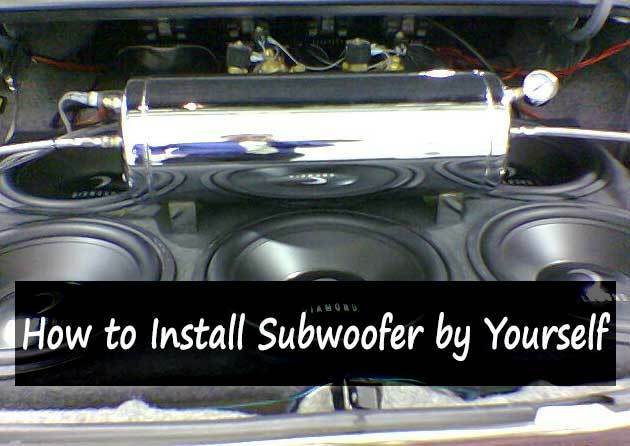 These are the simple steps that you will go through to successfully install the subwoofer in your car. The process should take about 30-45 minutes and you will enjoy the amazing sound system without spending some cash. The manual should always be used in every step to ensure a successful installation process.